June 2016 - the American Medical Association (AMA) published their highly controversial guidance, warning of the excessive amounts of blue light present in most White LED lighting, and providing recommendations for healthier Streetlights and Indoor lights. By 2016 there was already a large body of work from various institutions regarding the effects of LED's. However, the recommendations coming from the AMA, made news nationally and internationally. Some cities paused, and rethought their strategy for power-saving LED roll-out, with an expensive retrofit of LED streetlights. August 2018 - a research team at the Toledo University made international news again (e.g. ChinaNews 中文/英文) with a study released in Nature, showing how and why the shorter wavelength blue light (the same wavelengths as in the blue emitted by visual display devices) causes a toxic molecular build-up in cells containing retinol (as in the Retinal cells where the eye receives images), leading to premature cell death. The study also proved that other wavelengths (e.g. green, yellow and red), do not have this effect. The most alarming conclusion for many reading the study, was that accelerated macular degeneration (uncorrectable blindness) could come from using Phones and Tablets in the evening and at night, when the Iris is naturally wider, and accepts more high-energy blue photons. To be clear: blue light is not the enemy, and some hues are even necessary for health. Nor is it fair to label solid-state lighting as "bad". Nor are the inorganic Light Emitting Diodes (LED) the only, or the worst offender. 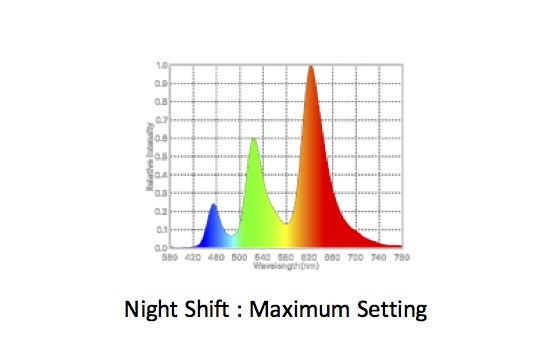 It is possible to efficiently recreate natural colors, and safer lighting, using LED's e.g. Amber LED Streetlights (see below). And as illustrated below, even the latest Organic LED's (OLED) and Quantum Dots (QD) are also at fault, if not worse. But first, it is essential to level-set, on what is "natural", and where does blue light fit in this picture. The spectrum of visible light refers to the ranges from longer wavelength (lower frequency) deep red down around 700nm, up to the shorter wavelength (higher frequency) deep-blue/ultra-violet (400nm). The energy (E) in the light increases with frequency, by a relationship known as "Planck's equation" (E = hc / λ), meaning that shorter wavelength blue carries roughly 50% more energy punch per-photon, than deep red. Blue is strongly present in ordinary daylight, as the image below shows of the light spectrum captured in the midday sunlight, of a cloudless Northern California day. Studies have long established that the blue-torquise wavelengths in daylight are important to us, the ipRGC (intrinsic photosensitive Retinal Ganglia Cells) triggers promotes alertness, and can help reduce winter-depression aka "SAD" (seasonal affective disorder), common to those in areas with shorter winter days combined with continuously overcast conditions (e.g. Seattle) which can explain many unusual behaviors (e.g. a predilection for online shopping, caffeinated drinks, and computer software). 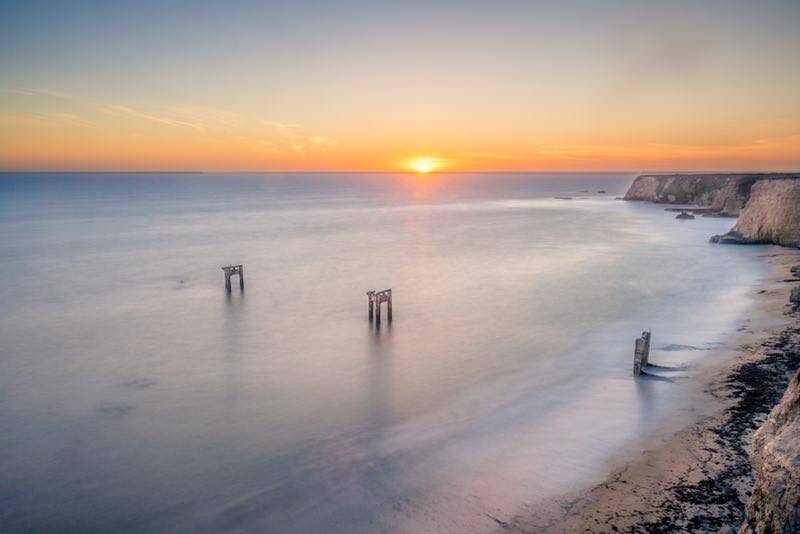 However, no matter where you are on planet Earth: as the sun sets, and the day transitions from afternoon into evening, the naturally occurring blue in sunlight diminishes. Blue is scattered and absorbed by proportionally more of the ionosphere/atmosphere (Rayleigh scattering), while the deep red to near-infra-red (NIR) rapidly then dominates - as revealed in this evening sunset spectrum capture, as below. Scientific research has already established it is the evening transition, from blue to red/NIR in daylight, that triggers plants to go into night time respiration mode, and is also known to be the essential trigger for animals and humans. Photo receptors in the eyes, particularly the ipRGC (Intrinsically Photosensitive Retinal Ganglion Cell), and directly influences the production/suppression of the hormone melatonin which is essential to sleep regulation. The side-effects of straying from the naturally occurring shift in environmental light were a key point in the AMA's guidance. But making light isn't new, so why hasn't this been an issue for civilization before now ? Historically, ordinary incandescent light, candles and even firelight, look very similar to evening light, having very little high-energy blue wavelengths. Moreover, long before the invention of fire, our brains had already evolved to adjust our perception of color, as the ambient light changes in the afternoon we still perceive a blue object as "blue", even through there are less blue photon's bouncing off the object. As our eyes receive a change in the ambient light color balance, our brains adapt to re-interpret the signals received so that our color vision still functions well, as environmental lighting changes. We can infer colors, although fundamentally, we can't see colors of light reflected off objects when the light spectrum no longer includes those color wavelengths. This is one of the reasons why it's difficult to distinguish a blue car from a green car, when both are parked together under an older style Yellow-Orange LPS and HPS (Low-Pressure Sodium, High-Pressure Sodium) Streetlights. The light being reflecting off these cars includes little or none of the wavelengths necessary to distinguish them. Coincidentally, many find these older streetlights "warmer", "softer" and the light to be very pleasing, and perhaps one simple explanation is : the light they produce contains none of the harsher, higher energy, wavelengths. Most modern visual display devices (e.g. smartphones), create color pixels in images by directly emitting light photons in combination of wavelengths including the red, green blue wavebands (e.g. CRT, LCD, OLED, Plasma, EL ... etc). Others types of displays create colors by selectively reflecting or absorbing surrounding light (e.g. eInk as in the Kindle, reflective LCD, TIR as in ClearInk, Phase-Change ... etc), and typically employ a frontlight to enable night viewing. Importantly, it was the invention of the White LED by Shuji Nakamora and team at Nichia Corp. of Japan, which produced a cheaper, more efficient, synthetic "White", that changed everything. This "White" light is actually a simple system of a narrow-waveband blue-light-emitting GaN/InGaN diode (LED), which excites a broad yellow phosphor material (aka YAG), which are combined together into one solid-state device package - the simplicity of the solution makes it cheap to make, as well as extremely power-efficient. The blue and yellow are complementary colors, this tricks the human optic nerves into perceiving "White", even though this obviously lacks the full broad spectrum of wavelengths in actual daylight white. Obviously this is the reason why LED lighting can often appear "harsh", and objects photographed under LED light lack color richness - simply because the full spectrum of colors are missing. The usual solution is to add more phosphor and other red phosphors that increase the output in the red side of the spectrum creating what's referred to as a "warm white". Some newer LED lamps extend this, creating long strands of phosphor to create a filament that looks like a vintage Incandescent bulb, but is actually still an LED, with an LED like spectrum. LED's are more efficient in producing light we perceive as bright, compared the fragile mercury-laden CCFL's they have replaced, and they produce none of the UV wavelengths; they are robust solid-state devices; are cheaper to make in volume, and do not require Mercury or other highly-toxic heavy metals (although they do depend on rare-earth metals like Yttrium, and Cerium, which predominantly come from China). The low-cost and small size (LED's in smartphone displays are between 0.3~0.4mm tall) were key innovations that enabled the thin, rugged, light-weight, portable visual devices we find everywhere today. What are the most harmful Blue wavelengths ? It is well understood that prolonged exposure to higher energy wavelengths carries health risks, however the Cornea and Lens of the Eye evolved to block UV from below 300 to 400nm, so these wavelengths are attenuated before reaching the retina, and remain less visible to humans. The unblocked wavelengths from 400 to 480nm form the colors that we can perceive as violet to to indigo to deep blue to light blue, however since the eye is relatively insensitive to the shorter wavelengths, we don't perceive blue light as equally luminous even when the optical power is dangerously stronger than that of an equivalent yellow or green light (roughly 8x sensitivity difference). The ISO standard EC 62471:2006 identifies the photobiological hazards from all light sources, and defines safe limits for spectral emission. While the American national standard ANSI Z87.1-2015 (covering protective eye-wear) identifies the wavelength by level of "Hazard Factor". In particular: 410nm to 478nm, carry the highest optical hazard. And 445~455nm as the range of blue with the extreme hazard - coincidentally 450nm is the waveband commonly used by the blue primary in almost all R-G-B Displays. Note the cells in the eye which sense circadian rhythms (ipRGC) peak in sensitivity at 482nm  and, as mentioned earlier, receiving some of these wavelengths in the light-blue-cyan range is important to health, alertness and avoiding depression (e.g. Seasonal Affective Disorder "SAD"), while it can disrupt sleep, not all blue light is harmful. Where are the harmful Blue wavelengths present ? 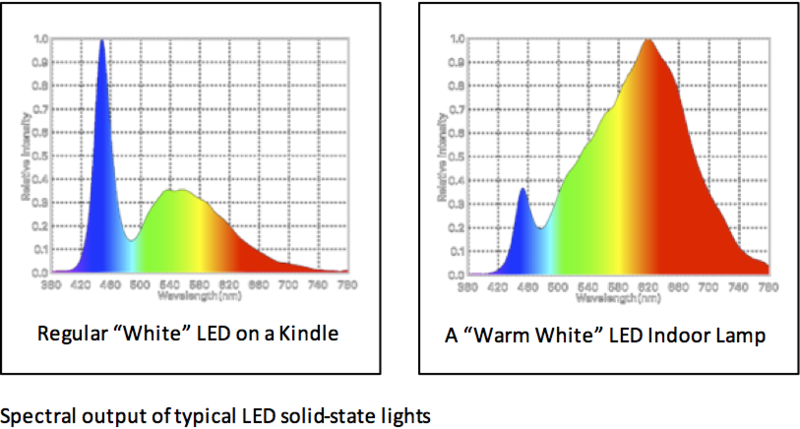 Here below are two examples of the spectrum of "White" LED's, captured from an Amazon Kindle Paper-White, and a so labelled "Warm White" Indoor LED light. As is clearly visible from the spectral measurements, there are strong blue peaks centered around 450nm, even when we don't perceive the light as containing "blue". The implication for fans of the Amazon Kindle should be immediately obvious. Fortunately, the eInk display technology used in the Kindle does not require an LED to convey image pixels. The LED front-light can be manually disabled, allowing the use of safer alternative front-lighting e.g. an incandescent bed lamp. The most common use for LED's in display is as the backlight to LCD's. Since LCD panels do not actually produce light, they only modulate it, they depend on the light behind the glass to create the pixels of light in the image displayed. Modern LED's have evolved considerably since Nichia's first White LED's, and have grown to replace other devices to become the dominant method used in the backlight of LCD displays (e.g. iPhone Xr), as well as "LED displays" based on discrete R-G-B (red, green and blue) LED's per pixel. Other displays use Quantum Dots (e.g. Samsung QLED TV), and some others are based on OLED's (Organic-LED Displays e.g. iPhone X, and Samsung Galaxy Phones). However in all of these displays, going back to the older CRT displays, the White we see on the screen has been based on the combination of blue, green and red primaries, which stimulates the human color optic nerves into perceiving white, as well as other colors, in the image pixels on the screen. Today: Prior-to these published reports, concerns have long existed about the harmful effects of blue, and almost as many have claimed to have solutions. Products claiming to remove harmful UV & blue light have included blue-blocking glasses, and screen films claiming to block UV & blue at the display. 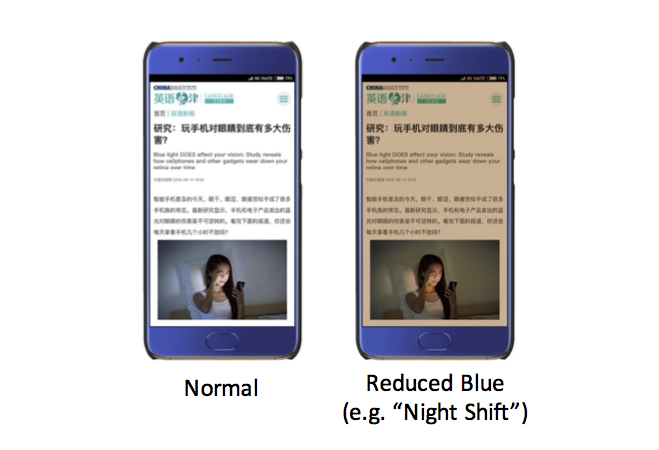 Additionally, smartphone, computer and visual device makers have released software features to help reduce blue light output from screens. The effectiveness of contemporary options, both from an experiential and empirical point of view, is presented as below. 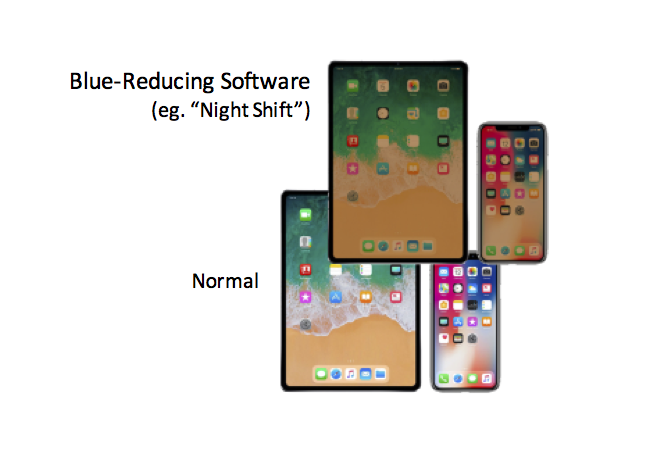 Visual Devices: Apple was early to release the "Night-Shift" feature in the base O/S as a software update of the iPhone, and iPad in March 2016, and the Mac family updates followed shortly after, through 2017. Samsung also released an update in the Settings->Display page : "Blue Light Filter". Similar features, and applications are available in other devices under various names. However, the first thing that most people notice in Night Shift mode (and similar features on similar devices and applications), is that white becomes "brown", and colors are vastly distorted : as if looking through "amber sunglasses". This is a unavoidable side-effect of reducing blue in displays which fundamentally rely on having all 3 primaries, in order to render White, or other colors. For example, although cyan is not blue, and is not a color actually emitted in contemporary displays, it is simulated by presenting the eye with both blue and green primaries simultaneously, in the relative strength necessary to trick the mind into perceiving just the right hue of cyan. However when reducing blue by software, such as Night Shift, blue and cyan become green, white becomes brown, and it looks as if everything is being viewed through an amber filter. Since the invention of paper in China, around the 1st century, the metaphor for written communication has been Black Text, and/or Color images, on the White Background. This is the metaphorical basis for the Graphical User Interface embodied in modern personal computing devices since the Macintosh, and was the default format for pages on the World-Wide Web. In our own surveys, we find some of the things most annoying for users of Night Shift, are : reading Text, Web-browsing, eMail, viewing Images and Social Media - all cases where the visual metaphor of Black Text or Color Images on a White Background are disturbed. Do you agree ? 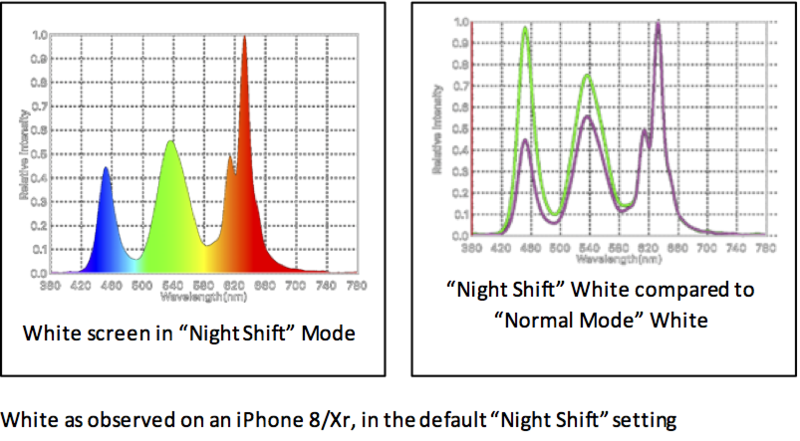 Below are measurements taken from iPhones with Night Shift feature in it's disabled / daytime, vs default settings. The measurements shown below are from standard applications: "Contacts", "Mail" apps, and by opening the Safari Browser, and also going to the http://google.com, and the Mac page on https://www.apple.com/mac/ web pages. 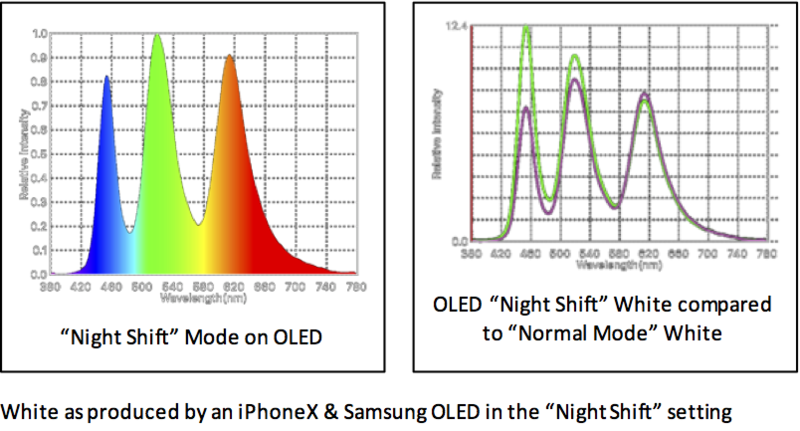 To demonstrate this is not an LED or LCD specific problem, here's a measurement taken from recent model iPhones. Firstly, with those models using an LCD panel, comprising an LED Backlight. Both the iPhone 8 and newest iPhone Xr were measured, and had essentially identical results (less than 5% difference). Secondly, the Apple "True Tone" feature, which detects ambient light tone and makes minor color adjustments, was both enabled and disabled - again with essentially identical results (less than 5% difference). And here, by comparison is the same image on devices using OLED screens, as measured on an iPhone X, Xs and in Samsung Galaxy Phone - very little difference was found between devices. The same results should be expected from any other LCD, AM-OLED, or W-OLED (e.g. as used in a newer HDR TV from LG). One thing to note about OLED, is that blue is the hardest color to produce. The blue emitter material has only 10~50% of the lifetime of the green and red organic phosphors - the blue organic material are being subjected to continuous bombardment by high energy photons i.e. yes, the molecules are literally ripping themselves apart. Image "burn in" is also a problem, but shorter-lifetime and decreasing brightness may not be critical decision factors in product categories designed for a 2yr replacement cycle. At the maximum Night Shift "warm" setting, with everything looking extremely brown, however these OLED displays still emitting an unnatural amount of blue. Alternatives such as recent TADF emitters are still a long away from mass-production-ready. Importantly, the more near term alternative: Samsung's QD-OLED will be based on a blue emitter exciting a Quantum Dot layer, and will likely still leak blue light, as explained below. Are Quantum Dots the Answer ? Displays using Quantum Dot have an even worse situation, apart from lingering concerns about the dependance on toxic heavy metals, and toxic manufacturing processes, the QD nanoparticles depend on the higher-energy blue/UV in order to generate the green and red photons via the quantum confinement effect. No blue would mean : no green, and no red. The following measurements were captured directly from a Samsung QLED 28" 4K display - QD's portable device are rare, none available to measure (for the reasons explained below). While QD's can operate at other wavelengths, they are at their highest efficiency when excited by higher-energy shorter wavelengths - unlike other materials, the decrease in excitation and QD efficiency with longer wavelengths is dramatic. And due to the minimal/non-existent Stokes-shift in QD color conversion particles, they tend to self-absorb their own photons, and photo-oxidize when packed tightly or exposed to strong light - requiring a thinner layer to be used, which will leak blue light (into any other color generated). A related problem occurs as the QD particles in QDEF films break down over time, with oxygen, moisture, heat and light, causing devices with Quantum Dots to exhibit a Blue Haze (as occurred on Amazon Kindle Fire HDX), which can continue to emanate blue light even when the blue-reducing software features (such as Kindle's "Blue Shade") are enabled. These issues (thick-films, lifetime, blue haze), and the costs, have stalled rollout of QD on portable devices. Why do displays depend on Blue ? Any Phone, TV, or other display capable of rendering images in contemporary standards (e.g. NTSC, sRGB, BT.709, DCI-P3 and the future Rec.2020) is conveying all the colors of those pixels using just 3 primary colors : Red, Green, Blue. This is based on the fact that human retinal cells will perceive various mixes of these 3 primary color wavelengths, appearing within a subset-triangular area of the range of visible colors (see the CIE-1931 diagram below). Synthesizing from just three 3 primary colors is very efficient, and it was one of the innovations that made the color TV revolution possible. RGB digital encoding saves image-data-space, and has become the foundational technology for the storage of images, and all modern display devices. For example, the Indigo color in a rainbow does not really contain red, it is actually a wavelength between blue and ultra-violet. But the blue photoreceptor in our eyes also senses red, so on a display Indigo is made from blue+red, and to our eyes that is enough for us to interpret the image as a rainbow. 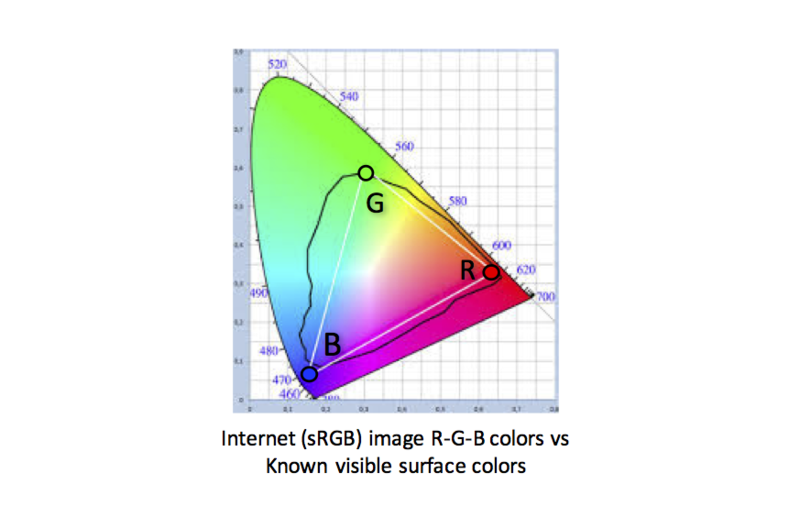 The vast majority of the images on the internet are encoded in "sRGB" equivalent to the BT.709 standard, designed to be compatible with the original Color-TV standard: NTSC. But as you may notice on the diagram, the triangle area is limited, and in fact only 35% of visible colors are viewable on a typical portable display device. Importantly, all devices rendering digital images must use the same blue primary color, located in the same high-energy short-wavelength part of the spectrum to reproduce that image correctly. If the blue primary is completely removed from contemporary displays, the colors in images created within the R-G-B triangle would collapse into an indistinguishable one dimensional R-G line (one can experiment with this on apps like NightTone). If only green and red primaries are available, then the range of colors is reduced to : green, red and brown - an experience similar to that of the current Night Shift like software solutions. If the blue is altered in wavelength, then the encoded image will no longer look the same, since all of the images colors and mixtures of colors were based off the assumption that the B in the RGB image was the specific wavelength, per the standard. In summary : either reducing, or altering the display's blue primary wavelength, to move it away from higher-energy range, impacts the ability to render colors described in these standards. It should be no surprise Night Shift looks bad. One important difference between OLED and LED-backlight LCD displays is that when the blue is turned down in an LCD display, it is done so at the LC and Polarization layers on the LCD. These layers function to absorb/transmit the light of pixels that are electronically adjusted to be blocked/conveyed. The reduction in brightness is done not at the LED's in the Backlight, where the light is actually being generated. Meaning: that electrical energy is still being expended inside the LED's to create blue, even if most of it is being tossed away by software such as Night Shift. Roughly 30~50% lost efficiency depending on the image and the aggressiveness of the Night Shift setting. Similar situation still occurs if setting the Desktop to a non-white background mode, such as the new "Dark Mode" theme in Apple Mac OS/X Mojave, the backlight is still using power to produce intense blue-based white, even if the desktop image is set to have a darker theme. To fully comprehend why this is so bad consider for a moment that the entire path in LCD's has an efficiency of 3~8% (even with the latest Quantum Dot displays). Meaning that if the image you see on the screen had a brightness of 300cd/m2 (as is the Microsoft standard for Windows laptops) the backlight behind it was likely producing 6,000cd/m2 (as bright as midday sunlight reflected off a metal surface). When looking at the Dark Mode example screenshot below, keep in mind that an incredible amount of power is being wasted to make the entire screen appear "Grey". By comparison, in an OLED screen when the blue pixels are turned down every blue emitting sub-component consumes less power, and also lasts longer - which is an important issue since (unlike LCD) OLED display suffer from burn-in, age more rapidly when brighter, and are less capable of intense brightness needed for daytime reading. Some solution to the shortcomings of OLED will be with us very soon. As new technology replaces the older style edge backlight system in slim portable LCD's, with an array of MicroLED's (also called MiniLED's) which can be individually turned up or down to control the light almost down to the pixel level, but with the robust long-lifetime high-brightness benefits of LCD. The catch : MicroLED's are also based on blue-emitting junctions, and with the failure of Quantum Dots to address those color conversion needs, those applications are looking for better color conversion solutions - ideally, one that is both more robust, and healthier for the eyes. 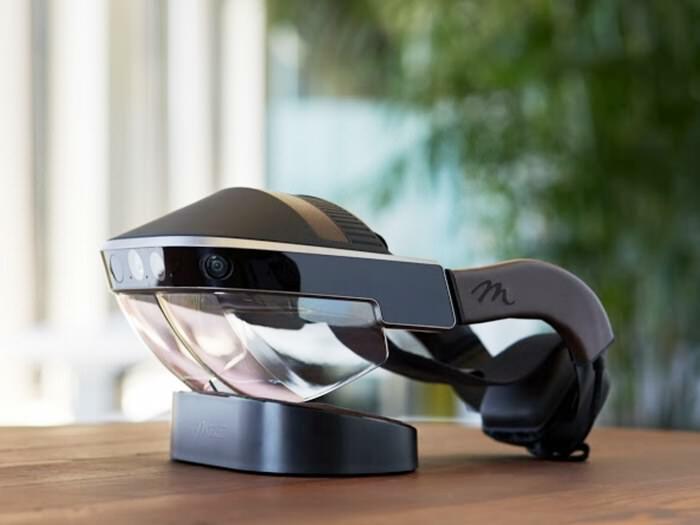 One of the other key places widely expected to see MicroLED proliferate, and replace OLED and LCD, are in AR and VR device applications. Whether LCD/OLED/MicroLED, the implications for AR/VR are even more profound. The intense display is just millimeters from our eyes, projecting unfiltered blue light, directly into the retinas. 1. If you've been retrofitting your home with LED lighting, think again. Even going with "Warm White" LED lighting still includes an unnaturally strong blue. 2. It takes more than a software update to fix the blue problem. 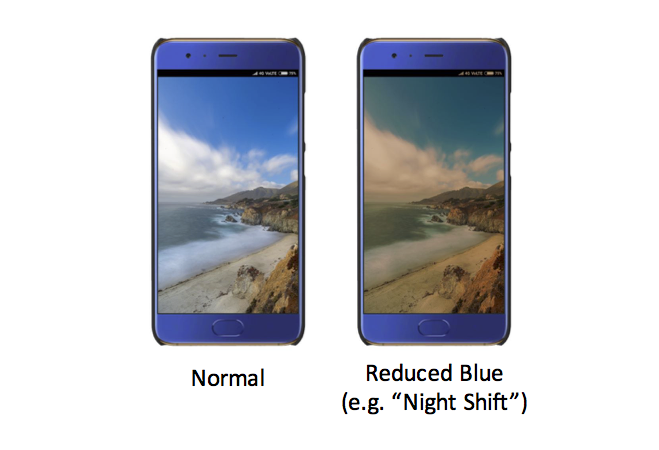 "Night Shift", "Blue Filter" and similar features on Phones and Computers, were important steps, but are not enough, and the visual experience that results is poor. More fundamental fixes are needed. 3. However, if you have not yet enabled any blue-reducing function - do so now. And if you must use a visual device at night, turn down the display brightness as much as possible, including when features like Night Shift are enabled. 4. It's clear we don't know all the side-effects of the devices that have only recently become prolific in the 21st century. In 20~30 years, when Millennials are in their 50's, what will be the impact for a generation that grew up in front of screens ? Parents may want to consider tightly monitoring their Children's screen time. Of course this includes all forms of screen time, whether it's social media interaction, posting homework online, or playing video games late at night. 5. People over 50 need to be especially cautious. As noted in many studies, around the age of 50 ~ 60 is when the process of macular degeneration starts to naturally occur. This is also compounded with the age-related reduction in scoptopic vision (the ability to see at night), and presbyopia (eye's lens gradually losing ability to focus). 6. It's not just phones, tablets, readers and computers, any display device or light with LED, OLED or Quantum Dot light source is a concern. While ePaper technology displays (like Kindle Paper-White) are reflective rather than emissive, the choice of lighting still matters. 7. For the future, strapping a VR headset, or AR glasses/goggles within inch(es) of our eye-balls is obviously a very concerning situation. 8. Social behaviors and norms for visual devices will likely evolve. And over time society may become better at managing our human and digital interaction time, and address some of the social concerns. Those kinds of changes can take a generation or more to proliferate. However the health concerns that the technology created, can (and should) be fixed by technology - immediately. 9. Displays enhance every aspect of our lives. They are the border to our digital universe, and display technology is become ever more crucial in sharing and communicating our imagination. To proliferate interactive visual devices, free of other health complications, it important to rework the foundations of light, color, displays and computer visual systems. Simply turning down the blue, in R-G-B display, may seem like a primitive solution. Not only because software remedies are typically feeble band-aids to the fundamental issues; but also for the poor experience and visual color distortion it introduces, and the fact it's not actually the full necessary fix. Regressing to incandescent bulbs, mercury laden CCFL's for backlight LCD, are not options worth championing both for the wasted power, but also because they still emit blue. Similarly switching to OLED, QLED or QD-LED may actually be worse. Although it could be healthier to communicate by candle light, or do our social media postings on cave-walls, we can't go backwards. What's needed are hardware solutions, fixing the problem at the source. Ideally continuing the power-efficiency trend begun with solid-state lighting, and ideally retaining maximum compatibility with LED/LCD/OLED displays, but in a healthier way. The better solutions will come in forms that can scale prolifically, while preserving as much as possible of the color, image content and contrast, that are essential to our contemporary textual and visual image interfaces. 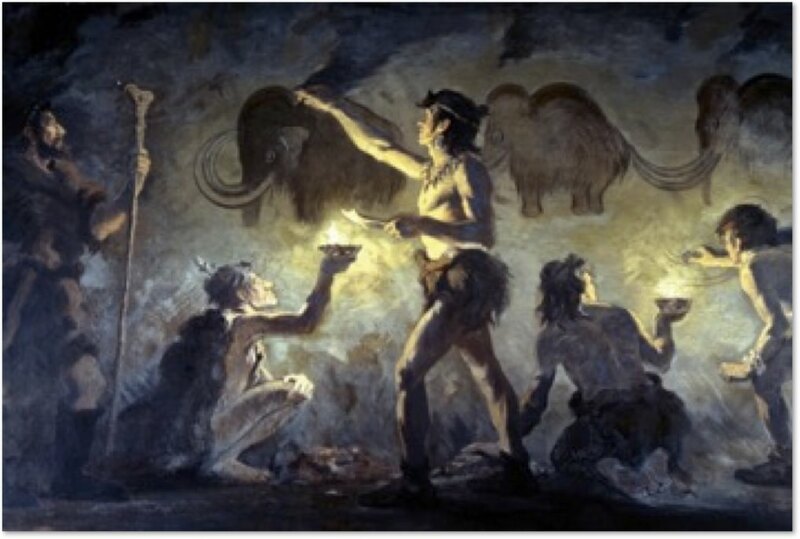 Light, color and contrast have been, and remain, the keys to communication, culture, art, and human civilization - its an important problem worth solving properly, solving it at the hardware level, and doing it sooner rather than later. Time to Rethink What's Possible. Part-2. Are Protective Eyewear, Glasses and Screen Films the answer ? In the next article in this series we will post an analysis of common Blue-Blocking Glasses and Films, and answer the question : do these gadgets do all they claim ? Will they protect us from harmful Blue wavelengths ? (c) Copyright 2018, PixelDisplay Inc. All rights reserved.